“The love that you withhold is the pain that you carry” is a quote I came across by Ralph Waldo Emerson. It stood out to me so I wanted to share it. Are you withholding any love? I’m sure I am. When I come into contact with difficult people, or people that seem hard to deal with. I will try to see the good in them, and see them the way that God does, this is my prayer today. “Knowledge puffs up, but love edifies. And if anyone thinks that he knows anything, he knows nothing yet as he ought to know” (1 Corinthians 8:1-2). How about building each other up today? 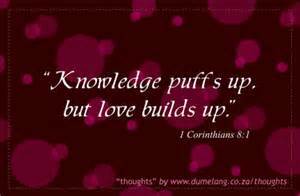 Author Zina HermezPosted on October 24, 2014 Categories InspirationTags Corinthians, knowledge, Love, prayerLeave a comment on Knowledge puffs up, but love edifies. I went to a benefit gala last night with very good friends. It was in honor of people with Spinal Cord Injuries. What a spectacular event! I saw everything from Acrobats performing stunts to a ballet dancer, to a Michael Jackson impersonator, and even rappers. Oh yeah, and Frank Sinatra too. I even watched someone dance on stilts 10 feet tall! It was a fun night! The D-Man Foundation was created in loving memory of Danny Kassab, a C-1 quadriplegic who was hit by a car at the tender age of ten. He reminded others life is too short to not live to the fullest. An inspiration, he meant so much to countless others. He was not aware of the impact he would leave. It was a night of festivities and events to honor people with disabilities, mainly Spinal Cord Injury. It was a beautiful night, and there were other people with injuries there. When I encounter these organizations that reach out to people with SCI, I feel so happy. It’s amazing to me the motivation and energy that people pour out into these non-profits, that mean so much in the lives of so many. Other favorites are Challenged Athletes Foundation, and the Mike Utley Foundation. Both support in helping others with disabilities ranging from all kinds of maladies such as Spinal Cord Injury, or leg amputation. They provide grants for adaptable sports equipment, or donate money towards funding research to find cutting edge state of the art equipment for people with SCI to join in physical therapy. They even award money to lessen the stress of the person with the disability. There is still not enough we can do about SCI, we are told there is no cure. The chances of walking after paralysis are often quoted as zero to four percent by doctors. These organizations offer a glimmer of hope, a light in the dark. But the greatest of all, love.